I didn't write a "thirteen months of Mae post", but we still have lots of fun Mae milestones to catch up on! A few weeks ago, Mae started saying her first real word: doggy. As soon as a dog comes into view during our walks or runs across the TV screen in a Beggin' Strips commercial, Mae yells out "DOG-GEE!" Just five days after her birthday, Mae stood up on her own for the first time. Since then she frequently just pops up in the middle of the floor looking super proud. She loves playing "How Big is Mae?" and keeps her balance (most of the time) when she throws her hands up in the air! Since she's finally standing, she has graduated to the next room at day care. 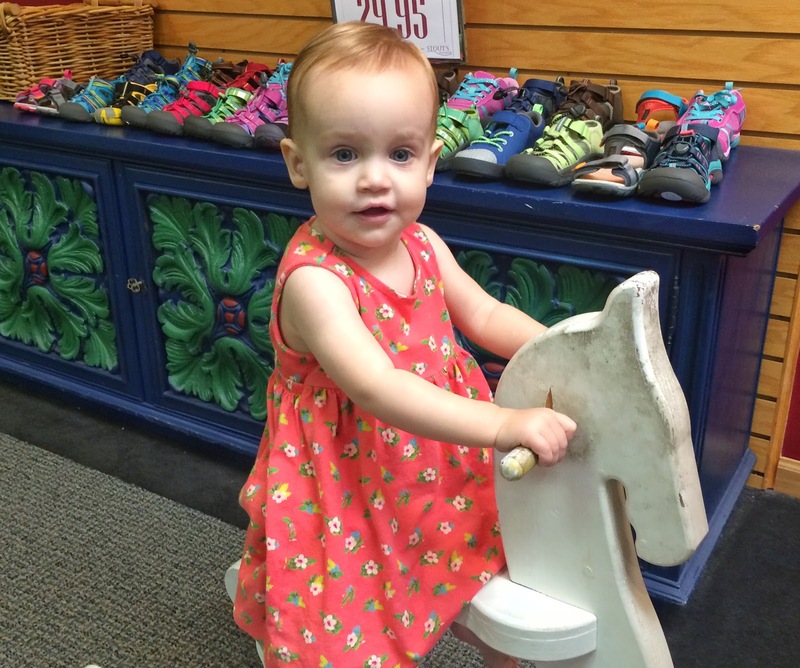 That meant a quick shopping trip to get Mae's first pair of shoes! We got a cute pair of white and pink Stride Rite sneakers with little butterflies on the side. Mae thinks they are weird and tries to chew them off her feet. Also, she has started to take a few wobbly steps at a time; I think her record is five. She looks like a tiny drunken Frankenstein, but she gets more stable every day. She thinks walking is hilarious and usually collapses into a giggly puddle at the end of a practice session. I'm looking forward to her walking just so her little knees don't get so scraped up now that she's in shorts most of the time! But possibly more exciting than her first word or her first step, was Mae's first bite of cheese. She is now eating (and loving) all forms of dairy including cheese, yogurt, milk, and my personal favorite... ice cream. I made a cheesecake for my birthday last week, and I have never seen her mouth open so wide as when I was offering her little bites. I have to admit, I did selfishly hoard the thumbprint cookies that Kathy made me (using my homemade jam! ), but I did share bits of the Boston Cream Pie cupcakes that she also brought to my birthday party on Saturday. I'm getting used to this dessert-sharing business; I haven't had to share with anyone for years now! And happy fourth of July to all of you!! Just made some chocolate/peanut butter cupcakes sprinkled with bright stars to somehow feel united to my "other country". Thank you! Happy Canada sesquicentennial (a few days late)!